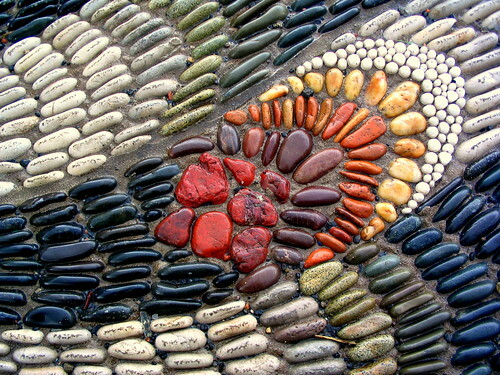 Phoneix Cobbles (detail)., originally uploaded by Sam Judson. Since it’s the day of release of the new Harry Potter book “Harry Potter and the Deathly Hallows”, it seemed appropriate to feature a British mosaicist and a phoenix. Maggy Howarth is a very wellknown pebble mosaicist and her books are probably the books to read on the subject if you are contemplating doing one of these. Phoenix Cobbles, originally uploaded by Sam Judson. 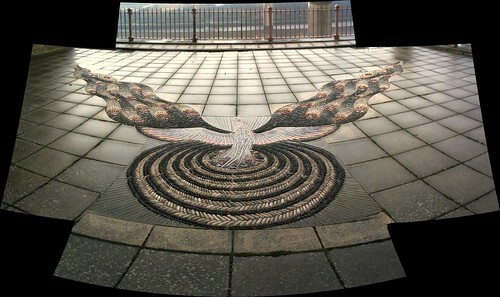 These Phoenix Cobbles are part of the Gateshead Riverside Sculpture Park. Revival is also the theme of the mosaic which shows a phoenix rising from the flames, symbolising Gateshead’s regeneration after a period of industrial decline. The mosaic (2.5 x 4 metres) is composed of pebbles with ceramic and stainless steel additions. Installed in 1994 as part of an improvement scheme for the historic area around the Toll House.